The Georgia Tech Jazz Program, under the direction of Dr. Chip Crotts, provides a great opportunity to study one of America’s greatest and most unique art forms. The Jazz Ensembles explore music from the late 1920’s through the present day, including works by composers such as Duke Ellington, Bill Holman, Sammy Nestico, Charles Mingus and Pat Metheny. Emphasis in these groups is focused on ensemble playing and the art of improvisation, an essential element in jazz tradition. Typically, 2 large jazz ensembles are offered each semester, as well as the opportunity to perform in one of our 3-4 small jazz combos. Each ensemble presents several concerts during an academic semester, in addition to on and off-campus events throughout the year. The Jazz Program also strives to bring professional artists to campus on a regular basis, and students will often have the opportunity to perform with these musicians and clinicians in concert during the year. In conjunction with the Ferst Center for Performing Arts, students also receive opportunities for clinics and masterclasses with jazz musicians who perform on campus as part of their yearly series. Guests of the Jazz Program in past years have included Arturo Sandoval, Earl Klugh, Maynard Ferguson, Roger Ingram, Dimitri Vassilakis, Joe Gransden, Dan Wall, Melvin Jones and Jon Faddis, among others. Housed in the new West Village, the Jazz Program is comprised of 85-90 talented students from across all academic majors at the Institute. As one of the larger jazz programs in the Southeast, the opportunities at Georgia Tech provide a fantastic musical outlet for students interested in jazz and improvisation. This creative outlet helps to balance the academic rigors of Georgia Tech and provide an enjoyable musical experience in the process. The GT Jazz Ensembles performs 4-5 concerts per year, while the Jazz Combos perform 2-3 concerts each year. Both jazz ensemble and combos are also requested at numerous institute and award ceremonies for performance throughout the academic calendar year. Below are sample programs from recent Jazz Ensemble and Jazz combo Concerts. Auditions are required for participation in the jazz ensembles or combos. Auditions are typically held on the first two days of each academic semester and sign-up sheets can be found on the door of West Village 171, the first day prior to each semester. All audition requirements can be found below under “Jazz Audition Information.” While every effort is made to provide an opportunity for all students, group size and experience level will often dictate our ability to do so. Ability to read music and play by ear is highly desirable, but not always required, given each unique ensemble setting. 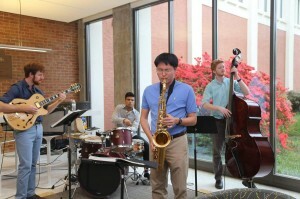 Students can earn humanities credit by participating in the Jazz Ensembles, as well as general elective credits by performing in one of our Combos, provided they meet the requirements listed in your Georgia Tech Catalog. Each semester will earn you one (1) credit towards your total count as determined by the Institute. If you’d like to see a sample clip of the type of things we do on the GT campus, check out a clip of one of our combos playing for “Carnivale at Georgia Tech”.